AirQ Check Mobile Health Device protects your air quality at home! Has it ever occurred to your home may no longer be the safest haven? The home environment is filled with a lot of odorous and odorless gases, and most people tend to ignore the good and bad of these gases, thinking that as long as they’re hiding indoors, they will not be affected by air pollution. But do you really know what it’s the air of your home? In fact, indoor air pollution has caused millions of deaths around the world, its harm to human health cannot be underestimated! Common sources of indoor air pollution included cigarette smoke, kitchen fumes, paint, furniture, decorating building materials, pesticides, detergents, fragrances, wax, photocopiers, and so on. In addition, even materials that come into close contact with our bodies, such as essential oils, cosmetics, perfume, hand cream, body lotion, baby lotion, car seats, color pens, whiteboard pens, candles, etc. also contain and emanate many hidden and harmful gases. These products will release into the indoor environment total volatile organic compounds (TVOC) (formaldehyde, acetaldehyde, benzene, carbon monoxide and other gases combined) as well as carbon dioxide (CO2). When the concentration of these gases exceeds the limits, it may easily lead to nasal inflammation, headache, liver and kidney dysfunction, damage the central nervous system, and even increase the risk of cancer. Don’t assume that home is the safest place! TVOC volatile harmful gases are hidden and released throughout the home, entering your body through the nose and mouth, breathing, skin, and slowly eroding the body. When a child holds a crayon and makes a drawing, when you apply make-up or skin care products, clean the bathroom, use the office photocopier, drive in the sun, you are likely to be caught in air pollution, unawares. 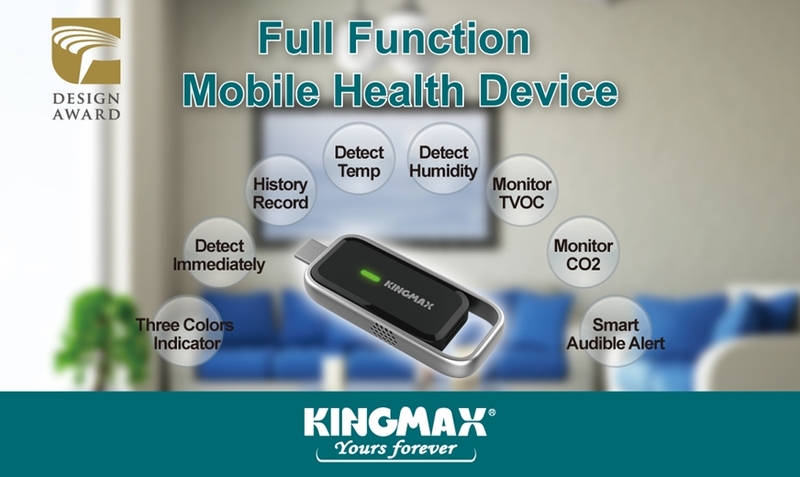 Now, for your home health and safety, the KINGMAX AirQ Check Mobile Health Device allows you to easily monitor every corner of your home, and test the gas values of each product around you to help you identify the products harmful to you, and replace them as needed. The AirQ Check is your first line of protection, helping you to select products with lower gas concentrations, and create a safer, non-toxic home environment!